ITER view shows density of input ports to plasma. Lithium Fluoride.The basic Hybrid blanket solvent. 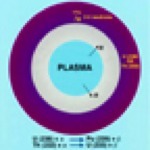 LIFE plant: Laser amplifiers, plasma chamber, coolant, breeding and power plant. It was an interesting idea because each D-T fusion neutron produced also releases 17.3 MeV of energy. Each neutron absorbed for fission in Uranium-235 releases about 200 MeV and about 2.5 new neutrons. A fission blanket can therefore be a huge energy multiplier for fusion reactions. If the Fusion core produces 10% of the neutrons to maintain the neutron balance in the fission reactor then fission is running well below criticality. Stop the fusion and the fission also stops promptly, a valuable safety feature. 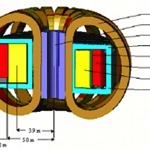 Fusion is the 'control rod'. Even so, it seems one may have to handle all the complexities of both reactor types, making the engineering somewhat implausible. In the 1980s, Ralph Moir led a team at Livermore to design Hybrids based on Magnetic Mirror machines as the core. This advanced the Hybrid concept to a new level where new technologies combined favourably. 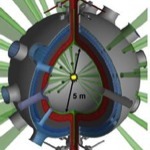 Fusion yields one neutron for the 5 nucleons in D-T. Uranium yields 2.5 neutrons from 2335 nucleons, so D-T makes 117 times as many neutrons per tonne of fuel. This means that the fusion core need only burn about 1kg to support the burn of 1 tonne of Uranium. 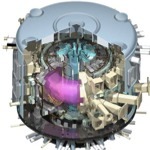 The core can run at much lower power than that needed for a pure Fusion power reactor. This eases a number of the materials and engineering problems. The Hybrid concept has swung from an unlikely technology mix to a preferred path to safer nuclear energy. Prof Weston Stacey of Georgia Tech has run a nuclear engineering school focussed on Hybrids and done detailed studies of a number of configurations. The SABR (2) version has a Sodium cooled fast reactor blanket tucked inside the major toroidal field magnets. This makes for easier access to the reactor components through the enveloping coils. Some feel for the hedgehog of neutral beam and radio frequency heating inlets to ITER is shown (3). The use of molten Fluoride salts (4) for Thorium reactors and for breeding Tritium around fusion reactors offers a profound technology switch. The Hybrid blankets can breed Tritium and burn Thorium, Uranium, or Plutonium fuels , and burn up high end 'wastes' as well. Just as advertised for the Molten Salt Thorium reactors, the liquid fuels can be dispersed to holding tanks in the event of a pumping failure. This eliminates the possibility of a melt down and loss of this elaborate reactor system. 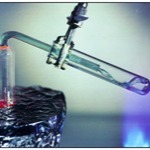 The online removal of radioactive fission products keeps their heat load low in the reactor. All the advantages of liquid fuels pass to a family of nuclear energy systems. The Hybrid concept works well for Laser Fusion as well. A small core can drive a liquid fuelled fission blanket. The future of this approach depends on the data coming from the Livermore National Ignition Facility (NIF) and from designs for much more compact lasers as are being developed at the UK Rutherford Laboratory. The art work for the LIFE laser fusion Hybrid (5) shows the concept. The complete facility with lasers, plasma chamber, and blanket heat exchangers to steam generation for electricity is used as a page background here. We have arrived at a point where the deeper discussions become rapidly more technical. For those with enough background the reports and lectures in the Hybrid Fusion Library will find many fascinating challenges in engineering, chemistry, robotics, and more. X ray cooling in chamber.